Browse our range of linear measurement equipment that includes calipers, distance meters, tape measures and lever dial indicators from manufacturers like Stanley and our own quality RS Pro brand. What is meant by linear measurement? Linear measurement refers to the measurement of a straight distance between two points, usually, this is a dimensional reference such as length, height or width of an object. Measurements are usually taken in a standard unit format that is either in metric or imperial units. The imperial system uses inches, feet, and yards. Whereas the metric system uses millimetres, centimetres and meters. Rules - for measuring lengths, available in a range of sizes and materials such as wood, plastic and steel. Calipers - a handheld device for measuring distances between two points. 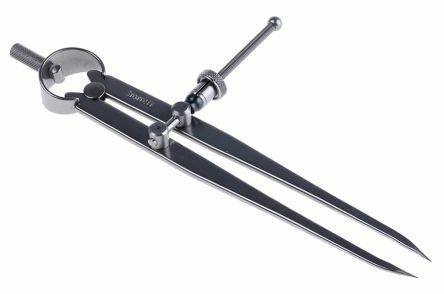 The tips of the caliper are opened to the size of the distance, then removed and measured with a device such as a ruler. 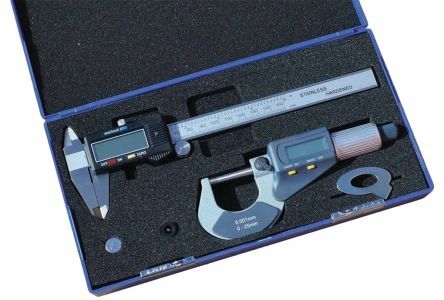 Common types include Vernier calipers, digital calipers and dial calipers. Tape measures - for measuring lengths and distances, commonly used in DIY and carpentry. Available in different sizes, materials and with different measurement scales. Micrometres - used for measuring small distances when high accuracy is required. Dial indicators - round dial face present with visual scale and needle. Ideal use with machinery such as milling machines to check the accuracy of a work detecting small imperfections. Distance meters - records measurements accurately using a laser, without any contact. Feeler gauges - for measuring the width of gaps, commonly used in engineering. Usually, have a collection of small lengths of steel that are different thicknesses. A dial caliper manufactured from hardened stainless steelThe dial rotates for zero adjustment and can be locked in positionThe scale has 0.02mm division1 pointer revolution = 2mmA thumbwheel offers ease of operation, a knurled lockscrew locks jaws if required. Mitutoyo 570-312 Digimatic Height Gauge, LCD Display, max. Digital height gauge with a 12in./300mm measuring rangeData hold, preset and direction changeover are all touch button controlledStatistical process control (SPC) data output is incorporatedFeatures include in./mm conversion, battery low indicator, ABS/INC function, and fine feed.